Visitors to La Revancha bakery in San Felix, Venezuela, are greeted by a large menu listing a wide variety of breads and baked goods. But before customers start to reach for their wallets, they need to look a little closer: Instead of a price, a “no” sticker is placed next to nearly all of the items, indicating their unavailability. Similar sights are common throughout the city’s pharmacies, grocery stores and car part shops as well. Once one of South America’s most prosperous countries, Venezuela’s economy has all but collapsed over the past five years due to government mismanagement and the falling price of oil, the country’s major source of revenue. And with Venezuela’s currency crippled and GDP stunted, commercial goods aren’t the only thing in short supply. “There’s really not much hope for the future,” said Father Greg Schaffer, pastor of Jesucristo Resucitado in San Felix, the Archdiocese of St. Paul and Minneapolis’ mission parish in the Diocese of Ciudad Guayana, Venezuela. Figures like Venezuela’s rate of inflation, estimated by the International Monetary Fund to reach 1 million percent by the end of this year, give some indication of the staggering challenge the country is up against. But at the parish, the crisis is measured less by economic statistics than it is by the pastoral realities Father Schaffer and his team face: families going hungry, elderly parishioners abandoned by adult children who can no longer care for them, and young men killed in escalating gang violence. Father Greg Schaffer, pastor of Jesucristo Resucitado and a priest of the Archdiocese of St. Paul and Minneapolis, preaches in this undated photo. Although San Felix, which joins with neighboring Puerto Ordaz to form the metro area of Ciudad Guayana, has always had its struggles with poverty, the situation hasn’t always been so bleak. Father Schaffer recalls that before the crisis began it was common for even the poorest families to hold a Sunday barbecue at least once a month. Now, with products like tripe and blood sausage all but gone, such gatherings are unheard of. Locals are lucky enough to get hold of a chicken, which costs nearly as much as the monthly minimum wage. “People tell me, ‘We used to think we were poor, but now we realize how good we had it,’” said Father Schaffer, a priest of the Archdiocese of St. Paul and Minneapolis, who has served the Venezuelan mission for 21 years. With the economic strain has come an increase in violent crimes. Father James Peterson, who served at Jesucristo Resucitado from August 2015 to July 2018, was held up at gunpoint during his assignment, and Father Schaffer said there have been threats to take parish employees hostage for ransom. After an attempted break-in last year, the priest added an electric fence to prevent access to the roof of the parish rectory where he lives. Parishioners, too, are affected by the wave of violence. Shortly after her father’s car was stolen at gunpoint, parishioner Zahyra Balza was also carjacked. Those experiences, along with the murder of a close friend during an attempted robbery outside a church, leave her fearful and cautious. “It sometimes feels like I’m imprisoned in my own country,” she said. Venezuela’s crisis is not only making life difficult now, but it’s also robbing the country of its future. According to the United Nations, over two million Venezuelans — most of them young people — have left the country since 2014. The same trend has played out at Jesucristo Resucitado, where Father Schaffer said a number of the parish’s most talented and reliable young people have left for countries like Chile and Colombia in recent years, making ministries like youth group more of a challenge. Dubraska Medina, 19, an active member of the parish, is planning to move to the Republic of Trinidad and Tobago for work. She dreams of opening a chocolate shop, but doesn’t think it can happen in Venezuela. “I love my home, but there are no opportunities here,” she said. The crisis in Venezuela has made the work of the mission parish more challenging in recent years. For instance, a successful partnership between the mission and parishioners of St. Joseph Catholic Community in Waconia that provided start-up loans to small businesses in Venezuela was forced to shut down because the rate of inflation made it impossible to pay back the loans. Service trips from schools like Cretin-Derham Hall High School in St. Paul no longer take place, and Father Schaffer hasn’t been able to find a doctor to service the mission’s medical clinic, as many medical professionals have left the country. But the crisis has also underscored the critical role of the mission, especially in a place like Ciudad Guayana. Located in Venezuela’s eastern “frontier,” the area has undergone significant growth in the past 50 years, but the local Church’s presence has lagged behind. 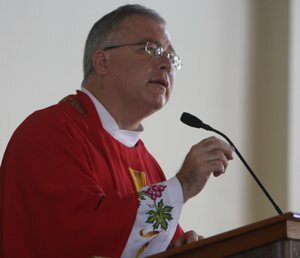 The diocese is uniquely dependent on both foreign priests and foreign assistance, said Father Schaffer, who also serves as the diocesan vicar general. The approximately 60,000 people who live within Jesucristo Resucitado’s boundaries are especially in need. Father Schaffer said that an estimated 80 percent of residents are unemployed, and less than 10 percent receive benefits and earn minimum wage. As a result, many rely upon mission ministries, such as the soup kitchen, which provides 63 people with a meal Monday through Friday. Lab work provided at the mission is also especially important, as an increasing number of men from the area spend time working in the gold mines in Venezuela’s south, and they often return with mosquito-borne illnesses such as malaria. But the primary mission of the parish is to provide for people’s spiritual needs, Father Schaffer said, although he adds that it can be hard to talk about a loving God when people are going hungry. He said he sees more people coming to Mass nowadays looking for hope. He’s also found that his preaching has pivoted to relate to the needs of parishioners, noting that keeping the heart free from a desire for revenge against people who have harmed family members is a reoccurring theme in both his homilies and in the confessional. “The Lord still calls us to holiness and sanctity, no matter how much money we have and how bad things get,” he said. As challenging as times are in Venezuela, Father Schaffer is exploring new ways to continue to serve the people of San Felix, in addition to help received from the archdiocesan Office of Stewardship and Development, which regularly sends money, medicine, food and supplies. Given the number of elderly who have been abandoned during the crisis, a project he’s currently working toward is the establishment of a hospice center to help residents live with dignity during their last years. As part of the bigger picture, Father Schaffer is looking into starting an endowment that could financially support some of the social services being offered in Venezuela, without necessarily relying on archdiocesan facilitation. Called Misioneros de San Pablo, the organization would maintain the 48-year old connection between Catholics in the Twin Cities and Ciudad Guayana even if the archdiocese would be unable to send priests in the future, handing the pastoral responsibilities of Jesucristo Resucitado back to its local diocese. The goal would be not only to support programs like the soup kitchen and medical clinic financially, but also to give business leaders, doctors and other lay volunteers the opportunity to visit the mission and offer their talents. To learn more about the Archdiocese of St. Paul and Minneapolis’ Venezuelan mission parish, Jesucristo Resucitado, or to make a donation, visit venezuela.archspm.org.